I found Last Call: The Final Chapter of F. Scott Fitzgerald at one of the local video stores and watched it last night. 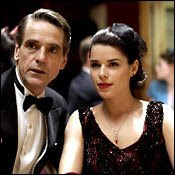 I loved Neve Campbell, and I now think Jeremy Irons stands alone in playing odd (sometimes very odd) characters. This performance should be set alongside his better known ones in Reversal of Fortune, Dead Ringers, Damage, etc. As for his American accent--well, let's just draw the curtain of charity before that scene, if only because his natural speaking voice is so cool. Last Call isn't a great movie. It's about an alcoholic trying to write a novel, so the opportunities for visual fireworks are limited. That's probably why writer/director Henry Bromell added some scenes with Zelda Fitzgerald (Sissy Spacek) as an apparition haunting Scott in his more deranged moments. The ghost story angle didn't work for me, but there are several worthy scenes with Campbell and Irons--tender, awkward, frequently funny. Watching Scott apologize to Frances after his drunken misbehavior is especially rich. When I say I loved Neve Campbell, I mean I admired her performance, felt deeply for her character, and developed a rare crush on her by the time the movie was over. A few months ago, I mentioned my telephone conversation with Frances Kroll Ring, who knew Carey McWilliams and served as F. Scott Fitgerald's secretary when he was trying to finish The Last Tycoon. Speaking with Frances made me want to know more about that unfinished novel, and I just finished reading Matthew Bruccoli's edition of The Love of the Last Tycoon: A Western. I will not try to assess Fitzgerald's achievement here. But I will say that I respect any major American novelist whose work makes room for Buddy Ebsen, best known as Jed Clampett from "The Beverly Hillbillies." I will go further: That reference makes me proud to be an American. What's that? You don't believe that F. Scott Fitzgerald can be connected, even indirectly, to a sit-com character who routinely referred to his swimming pool as "the cement pond"? (Extra points if you remember the Appalachian pronunciation Ebsen brought to bear on that phrase.) Well, look for yourself on page 101. And don't forget: When it comes to the American culture, you either like the circus or you don't. Next up, still: Last Call, the DVD with Jeremy Irons, Sissy Spacek, and Neve Campbell, which is based on Frances's memoir, Against the Current: As I Remember F. Scott Fitzgerald. Last night PBS aired "A Sad Flower in the Sand," a documentary about John Fante and Ask the Dust. What a pleasure to come upon. It includes interviews with family members (including Fante's late wife Joyce), Robert Towne, and Fante biographer Stephen Cooper, whose book I've praised here and elsewhere. Steve alerted me to this documentary some time ago--it was made in 2001--but I'd never seen it until last night. As the title indicates, the film emphasizes the bleak aspects of Ask the Dust, but I think it underplays the comic effects Fante produced by juxtaposing that bleakness and squalor with his protagonist's soaring literary, financial, and sexual aspirations. But those comic effects are perfectly reflected in Charles Bukowski's 1979 preface to the Black Sparrow Press edition, which is included in the film. The film also includes several references to Carey McWilliams, Fante's best friend. Steve even reads Fante's evocative book inscriptions to Esther Blaisdell, McWilliams's girlfriend during that time. I was happy to see that connection, since Fante is a big part of my McWilliams bio--almost a kind of foil. A few months ago, PoliPointPress published Jeff Cohen's Cable News Confidential, which describes Jeff's years at CNN, Fox, and MSNBC. Jeff was a longtime media critic before he secured a front row seat at the cable news circus. (Many will also recognize him as a key expert in Robert Greenwald's documentary Outfoxed.) This is a very funny book, but it delivers a serious message about the corporate media's failure to cover the most urgent issues of the day. For more information on the book, see the PoliPointPress link on this site. I'm especially proud of this one. Jeff will be appearing with Scott Ritter tomorrow at College of Marin (2:00) and in Oakland (7:00, 2501 Harrison St.). Just heard an NPR piece about the City of Los Angeles returning water rights to the Owens Valley--only one century after the Great Water Caper. That story became part of Carey McWilliams's legacy after he heard it from Mary Austin, wrote about it in Southern California Country (1946), and then watched it go Hollywood in Roman Polanski's Chinatown (1974). It's more than a little ironic that this piece should run on December 7, especially since Manzanar, the site of a major internment camp for the Japanese during World War II, is right there in the valley. Today is the 65th anniversary of the Pearl Harbor attack--the day President Roosevelt said would live in infamy. But another infamy followed that attack, too--namely, the internment of over 100,000 Japanese on the West Coast. Carey McWilliams was serving in state government during that time, and although he worked behind the scenes to forestall the evacuation and internment, he didn't publicly oppose it while he was chief of California's Division of Immigration and Housing. After all, his Democratic governor supported it, and a Democratic president ordered it. But soon after the 1942 election turned him out of office, he spoke out against the internment and wrote Prejudice in 1944. It's an extraordinary book that demolished every argument for the evacuation and internment. The same year, it was cited four times in a Supreme Court dissenting opinion, when the court upheld the constitutionality of the internment--a position it later reversed for the reasons laid out by McWilliams. Unfortunately, Prejudice is out of print now, even though it's one of McWilliams's most amazing books. I hope the McWilliams family will work with a publisher to get that remarkable title back into print. I just finished reading The People's Machine: Arnold Schwarzenegger and the Rise of Blockbuster Democracy by Joe Mathews. It's a solid piece of work, but it closes just after Schwarzenegger's initiatives went down to defeat in November 2005. As a result, it doesn't include the scene in which Schwarzenegger, almost alone among bigtime Republicans, surfs the Blue Wave of 2006. Even more remarkable is the fact that he did it in one of the bluest nations in the state, and only one year after he got bageled on his initiatives. As one Sacramento insider put it recently, "Schwarzenegger crashed his Hummer into a tree at 100 miles an hour and walked away without a scratch." Like many chroniclers of California politics, Mathews cites Carey McWilliams in his prologue--in this case, McWilliams's observation that California "has not grown or evolved so much as it has been hurtled forward, rocket-fashion, by a series of chain-reaction explosions." Mathews plays off the quote nicely when he adds, "The whole damn place was a special effect." If McWilliams were around today, he would see Schwarzenegger as fresh evidence for his claim that California is the Great Exception. Certainly most of Schwarzenegger's success can be traced to three factors McWilliams stressed in his description of California's political culture-- the extraordinary power of media handlers, independent voters, and direct democracy. To see how little that culture has changed since McWilliams nailed it in 1949, check out "The State that Swings and Sways"--Chapter 11 in California: The Great Exception.